Discussion in 'The Lounge' started by COmtbiker12, Sep 4, 2005. Atleast it'll make a somewhat cool wall ornament. Glad you are ok. No fork here, but check the hell out of that head tube. 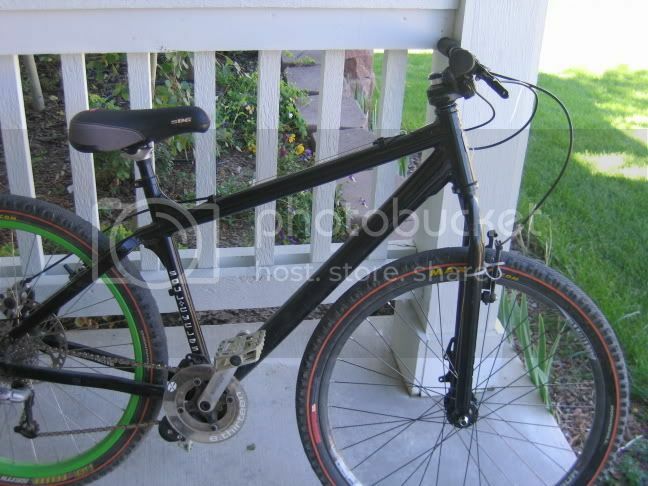 I have an 03' Dirt Jumper I would sell for about $150. Judy tt 80mm travel no damping. $20 and shipping. Price, would i be able to make payments to you for the DJ? Also, is it 20mm? What were you doing using a rigid fork for DS in the first place? Yeah I bet I could allow that. Its a DJ1 03' but some of the parts on the QR20 are missing. Like the little bolts, but I might have some more, only one problem, I just got to school, so my mom would have to help me, and you could send the payments to me at school. i second that...i'd check out the headtube junctions....if you were able to bend a rigid fork like that, the headtube must have taken one hell of a shot. It's fine. Just turn your stem around 180 degrees. yeah, what the hell WERE you doing riding a rigid fork? you must be a BAMF! I thought it would be fun to style it up rigid. And that's how my hardtail was setup. More than likely I'll be getting a DJ or something now (from Price most likely). I have yet to check the headtube, not quite sure what to expect from that.